The competitive exam system and the coaching industry demand extraordinary capacities of mechanical learning. 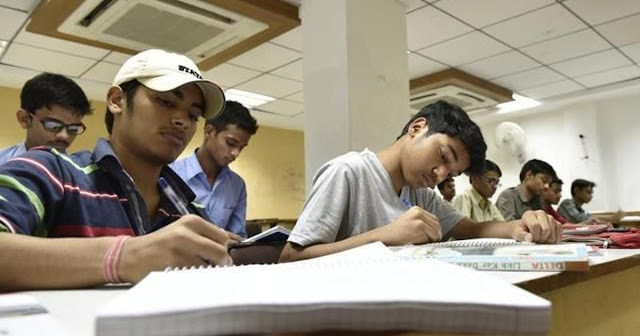 At this time of the year (April-May), national newspapers are full of front-page news and full-page advertisements of young women and men who have cracked the Joint Entrance Examination-Main, the test that qualifies students to take admission in a variety of technical institutions. It is also the pathway to appearing for the JEE-Advanced examination for admission to the Indian Institutes of Technology. Major coaching institutes, mostly headquartered in that surreal Rajasthan city of Kota, exhibit photographs of their star students – confident posture, unwavering gaze, uniform attire – in these advertisements. Their “All India Ranks” adorn the publicity material as concrete proof of both their own worthiness and that of the coaching institute. Among all this, there are two JEE-linked individual stories this year – one signifying spectacular success and the other of colossal failure – that provide necessary insight into the tragedy of our educational system. Tragedy has become so much the norm that we may not think of it as such. First, the celebrations of success. In a deeply asymmetrical society, it is perhaps natural that we rejoice in the against-all-odds performance of a 17-year-old Dalit boy from Udaipur who achieved a perfect score in the examination. Kalpit Veerwal’s father is a medical compounder and his mother is a teacher in a government school. Veerwal is reported as saying that he started preparing for the examination when he was in Class 8, studying up to seven hours a day and mainly using the internet to gather information. He joined the Udaipur branch of one of Kota’s best known coaching institutes and is now preparing for the JEE-Advanced examination. There are many social media posts congratulating the young man. Most speak of the extraordinary nature of his success, given his social background. Some speak of it as a challenge to upper-caste monopoly over knowledge systems and material progress. You might have missed the other JEE-related story that appeared immediately after the media coverage of Kalpit Veerwal. It was not on the front page of any newspaper. This was about a student from West Bengal who had been undergoing coaching in Kota but committed suicide as he failed to qualify for the 2017 JEE-Mains. His name was Ajit Pramanick. Though Pramanick’s life-blood simply bled into the back-page newspaper ink, his death tells us something about the end of education itself. Individual successes within our education system – if it is that – provide very little indication of the wider miseries it produces, both in terms of individual tragedies and the tragedy of the education system itself. Of course, the two are connected. According to one newspaper report, Kota Police data indicates that 72 students from the city committed suicide between 2011 and 2015. The competitive examinations system and its auxiliary, the massive (and massively lucrative) coaching industry, are part of a broader educational landscape where rote-learning forms the basis of success and failure. These are the killing fields of education in more ways than one. They demand extraordinary capacities of mechanical learning, which have little relation to creative thinking that provides solutions – scientific, technical, social – to societal problems. This is not an individual failure of the imagination, for everyone seeks to better themselves through their own circumstance. Rather, it is a policy failure: the death of public imagination that can create a social-useful but also individually hopeful educational system. And, one that is able to engineer multiple ways of nurturing human capacities. The many hundred-thousands of young men and women who throng Kota each year are only promised dead end solutions on both these counts. Ajit Pramanick’s suicide is a personal tragedy for his family but it is also a form of social suicide for a society that so wholeheartedly endorses the idea of educational success that underlies his death. There are, we know, multiple actors in this personal and social tragedy, for suicides have both personal and social lineages. It is a tragedy scripted by national and multinational corporations with substantial investments in the examinations business, as well as the state that creates and maintains the grounds for it. Between private profiteering and public inaction lies an entire population of young people forever marked as failures because of their ineptitude at mechanical learning. It is rarely that private investment is made for the purposes of furthering social good (if that happens, it is usually a byproduct), but when state policy is unable to identify it, we are truly in an educational abyss. Given the manner in which state policy has wilfully allowed education to be so narrowly interpreted, is it any wonder that our universities are research institutes – while part of one of the largest systems in the world – that hardly produce cutting-edge research or innovative solutions to social problems? Frequently, there are references to the coaching and examinations ecosystem as a grotesque caricature of education, and hence not the actual system. Unfortunately, the gap between the actual system and that represented by its supposed caricature is not as wide as we might think. The actual is now barely distinguishable from its apparently distorted image. The monstrosity of our thinking might be gauged by the normalised tones of media reporting on Ajit Pramanick’s suicide. His parents, one report noted, were scheduled to arrive to pick up their son’s body. As the minuscule numbers of the successful gazed at us from newspaper front pages, a representative of the massive platoon of failures was banished to the anonymity of a single column many pages beyond. There was discarding of human potential and there was blood. But the blood is seeping through the entire body politic.